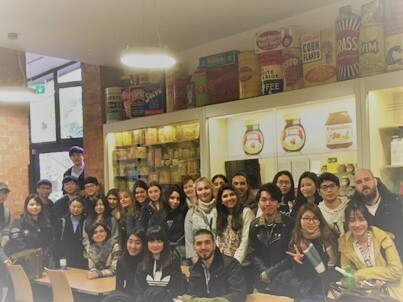 Dr Kaouther Kooli, Dr Julie Robson and Samreen Ashraf visited the Museum of Brands, Advertising and Packaging in London with FoM UG and PG marketing students. The Museum examines the history of consumer culture from Victorian times to the present day through the study of advertising and packaging. Students had an opportunity to apply theory to real life brands. In a one-hour seminar and working in small groups, students were asked to select one brand in the museum, identify how the brand had changed to-date and envisage how it might look in the future. Drawings were used to picture the changes. Students also travelled through the time tunnel of brands to learn how brands and packaging have developed at key points in history and how brands and culture are intertwined. Students attending this event were from the MSc Marketing Management, Contemporary Issues in Marketing unit and the BSc Marketing.